Zooplankton in the ocean are eating microscopic plastic particles and passing those contaminants up the food chain to salmon, whales and other species at an “alarming” rate. That’s the conclusion of a new study co-authored by Dr. Peter Ross, the top ocean pollution researcher at the Vancouver Aquarium’s Marine Science Centre. Zooplankton are tiny creatures that make up a major food source for juvenile salmon, as well as baleen whales. Microplastic particles are barely visible small fragments, fibres and granules that are widespread in the ocean due to the breakdown of plastics – from both litter, ropes and other sources such as sewage effluent in major populated areas. They’re different from plastic microbeads that are deliberately used in toothpastes and exfoliants. Ross and his colleagues estimated a juvenile salmon in the Strait of Georgia may be ingesting two to seven microplastic particles per day, and returning adult salmon are ingesting up to 91 particles per day. A humpback whale could be ingesting more than 300,000 microplastic particles a day. “These particles could pose a serious risk of physical harm to the marine animals that consume them, potentially blocking their gut or leaching chemicals into their bodies,” Ross said. He said the research is the first clear evidence that species at the bottom of the food web are mistaking plastics for food and potentially posing a risk to other animals. The findings were published in June by the journal Archives of Environmental Contamination and Toxicology. It’s unclear yet whether microplastics in the marine food web pose a human health risk to people who consume seafood. Exposure is thought to be lower with fish that people don’t eat whole – such as salmon – compared to shellfish such as mussels, which an earlier European study also found to contain microplastics. That study suggested the plastic fragments may also absorb and pass along persistent organic pollutants. Georgia Strait Alliance executive director Christianne Wilhelmson said the findings shed new light on the threat of virtually invisible ocean contamination, as opposed to more obvious marine garbage. Wilhelmson said the growing prevalence of plastic microfibres offshore is reversing the thinking on some practices once thought to be green. 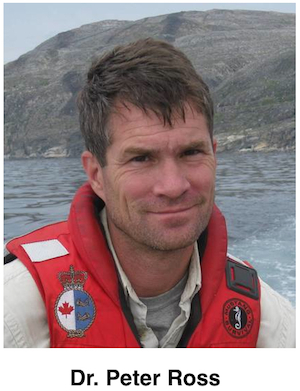 Ross joined the Vancouver Aquarium last year after the federal government in 2012 shut down his marine toxicology program within the Department of Fisheries and Oceans. He was one of dozens of scientists terminated with the elimination of the national contaminants research program. Ross had testified in 2011 at the Cohen Inquiry into declining sockeye numbers that toxins flushed down Metro Vancouver sewers were likely a contributing factor. 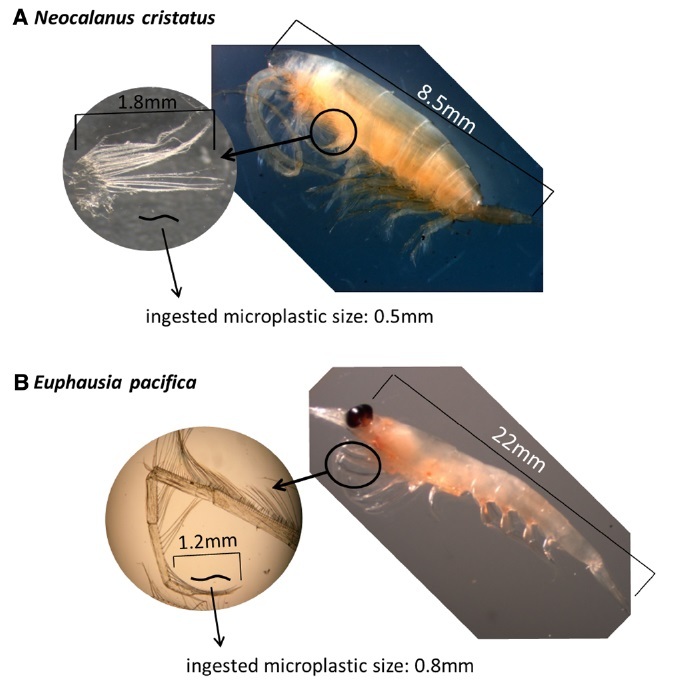 Diagram of two zooplankton species and ingested particles.